Are you as Tableau-smart as a Tableau consultant? I joined Tableau in September 2013 as a product consultant. We PCs are Tableau experts. We help with all things product-related, from technical sales to internal support and training, to content development. Basically, if you have a problem in Tableau, you get help from a PC. So how did I become a Tableau expert after graduating with a degree in Environmental Science and Studio Art? How did I go from possessing weak Excel skills to writing advanced calculations and nested LOD Expressions? Every time I solved a customer challenge like the one above, I would document the solution so that I could reference it in the future. Eventually I had built a library of practical solutions that I could use to easily answer any Tableau question. Solving these customer challenges proved to be the most effective way of learning Tableau. I noticed that this was not just true for me, but for all of the PCs around me. So I turned my library of Tableau solutions into a library of Tableau challenges. I called this the challenge workbook. Don't seem to be able to download the workbook. 3. Download the challenge on the bottom to try for yourself. If the images are not rendering when you click the challenge try a different browser. I know that IE and Chrome both work. Chrome works best. If you are getting errors using other browsers please let me know which they are so that I can make a note of this in the viz. @Bronson There's a third solution to Remove Null and All - creating a duplicate field, excluding the item Null, and adjusting the filter options to only show relevant values. That's the way I have been removing my Null values too (but not always successfully)! Are you interested in seeing how to build a similar workbook? If you are just having trouble downloading the challenges see my comments below. Thanks for the practice lessons. It only allows for you to download Image or PDF, not the whole workbook -- even clicking on an individual link. @Bronson, Where can we fins the solutions for the other challenges? Can these challenges be opened in Tableau public? When I download a challenge, I receive a pop up that it does not exist on Tableau public so cannot be opened. However, I see it on your Tableau Public profile. Anyone else remedy this issue? Tried in IE, Chrome, and a few other things.. Solved the Beginner > Measure Selector (solution time: < 1 minute). This is a fantastic resource, Thanks Bronson. Despite the words of caution, but eager to get my hands on the workbooks, I tried using FireFox to download the workbooks and it works well (but not like you'd expect). 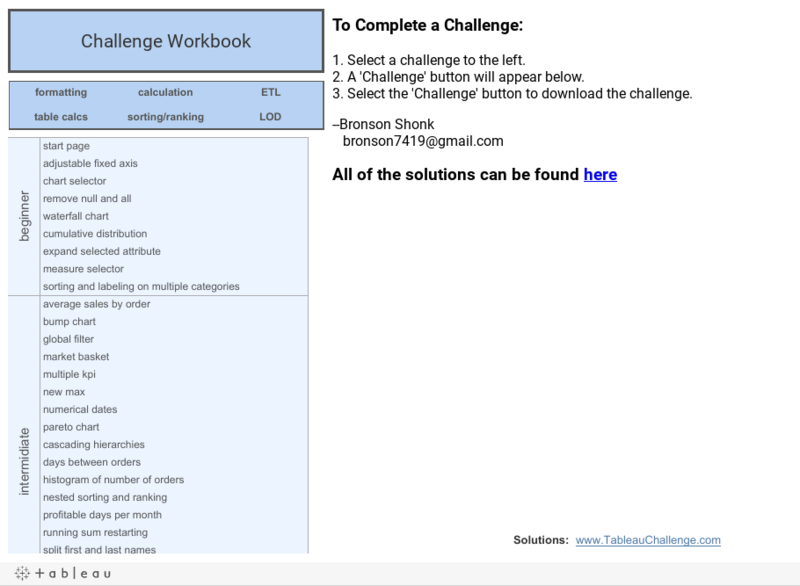 Just click the link of the challenge, hit the Challenge-button at the bottom of the workbook. Now comes the trick... click with your right mouse button in the frame with the gobbledygook, select 'This frame »' and download using 'Save Frame As'. Workbook is now downloaded as .twbx. Can you please tell me what dataset you used for time series alignment challenge? The Intermediate > Time Series Realignment is rather interesting as in real life i wonder how it may be applied to offset start dates to same date. is that your provided image right?. iam asking for the purpose of cross check iam not getting the solutions if your image is right? The images should be correct - can you let me know which one you are trying and I can double check. I was working on the Market Basket challenge and came across an issue (using 9.2, 9.3 & 10.0 versions). I'm not able to add the <> join for the sub-category join. Does anyone else have/know of this issue? I'm going to try and work this by using a calc instead, but was curious. Please disregard, as I missed the comment concerning the Excel connection. I was able to solve for this with a table calculation using the Excel data. some challenge don't have any solution or tips ( as expand selected attribute). Where can I find them? hi!! could you please add solution to expand selected attribute. I have tried everything and not able to get it. I came across this webpage today and I am not able to solve the first question itself. "Fix the x-axis so that the end never goes below 20% regardless of the size of the bars, but will expand larger when the bars are above 20%." Could you please provide the steps or hints to solve this.